I'm a storage connectivity nerd, but I often learn new things I missed. Reading about the new Tyan servers with AMD's Epyc server processor, I was surprised by an off-hand mention of "OCuLink" as a storage expansion port. 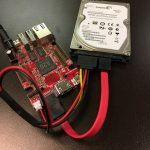 Naturally, I did some digging and discovered what it is: OCuLink is a competitor for Thunderbolt for cabled PCI Express connectivity, offering similar … [Read more...] about What is OCuLink? Musing: Could We Replace Ethernet With PCIe? 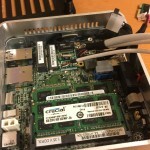 Greg "EtherealMind" Ferro recently "mused" that it might be a good idea to replace PCI Express (PCIe) inside servers or rack-scale infrastructure with Ethernet. But this seems to be the exact opposite of the direction the industry is headed. Rather than replacing PCIe with Ethernet, companies like Intel seem set on replacing short-range Ethernet (in rack-scale systems) with … [Read more...] about Musing: Could We Replace Ethernet With PCIe?